In France, Young Muslims Often Straddle Two Worlds : Parallels An estimated 40 percent of France's 7 million Muslims live in and around Paris, many of them in the poor suburbs. It's hard to escape the banlieues, even for those who work or attend school elsewhere. 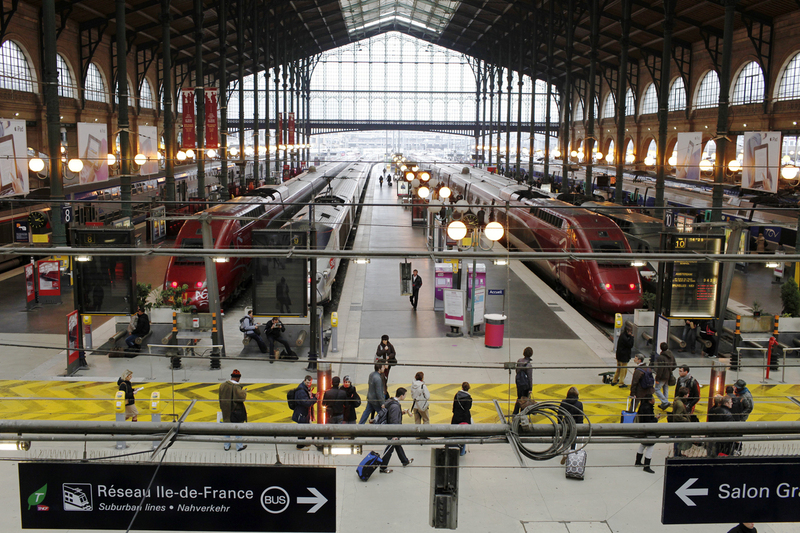 Gare du Nord railway station is what British historian Andrew Hussey calls "the frontier zone" between the world of affluent and well-heeled Paris and that of the banlieue, the suburbs north of the French capital that are home to largely poor, immigrant and minority communities. Many live in poor suburban communities known as banlieues., and the residents of these communities have felt increased scrutiny since three young Muslim men, each born and raised in France, killed 17 people in January's terror attacks in Paris. The bustling Gare du Nord train station marks the frontier between central Paris and the banlieues, says Andrew Hussey, a British historian who has written about the tensions between France and its black and Arab minorities. It's the place where the suburbs of northern Paris — which consist of mainly immigrant, minority populations, who are often very poor — come into contact with the relative affluence and comfort of the city center. "The thing about the Gare du Nord is that that's where you feel — the kids from the banlieue feel excluded," he says, "They come here, and like it's a frontier zone between Paris over there — which is very well-heeled and very rich and very beautiful, and over there [the suburbs] — where they're sort of, you know, cast out into this world that's not quite connected to the center of France." Ismael Medjdoub is one of these "kids from the banlieue" who straddles these two worlds. Medjdoub, 21, a third-generation Frenchman of Algerian descent, spends a lot of time on the subway getting to and from work and school — up to four hours every day, including Sunday. Ismael Medjdoub grew up in one of Paris' banlieues. He spends up to two hours a day commuting from his home in Tremblay en France to work and to school at the prestigious Sorbonne in Paris. Medjdoub is a student at the Sorbonne in Paris, and would like to get an apartment in the city, but he says his district number — it's like an American ZIP code — is hurting his chances. Make no mistake, Medjdoub says that he's proud to be from a banlieue — his town, called Tremblay en France, is next to Paris Charles de Gaulle Airport — but that he knows people look down on those communities. "Every time that I say to someone I'm coming from suburbs, they have some pity for me that I cannot understand," he says. He recalls an incident during his first year studying history at the Sorbonne. He had gone to see his professor, to apologize for a delay in turning in his schoolwork. "He answered to me: 'Don't worry, you are coming from suburbs, so I know what you are feeling,' " Medjdoub says. "And I was — 'What? I mean, come on guy, I am living in a big house with two cats! So you see it's not the image that you are making of suburbs.' "
Ismael Medjdoub's mother, Fatihah, was born in France in 1963. Her family had emigrated from Algeria earlier. She says young Muslims of her generation practiced their religion privately — unlike the current generation's very public assertion of its Muslim identity. We arrive at the small, quiet station in Tremblay en France, a world apart from Paris. 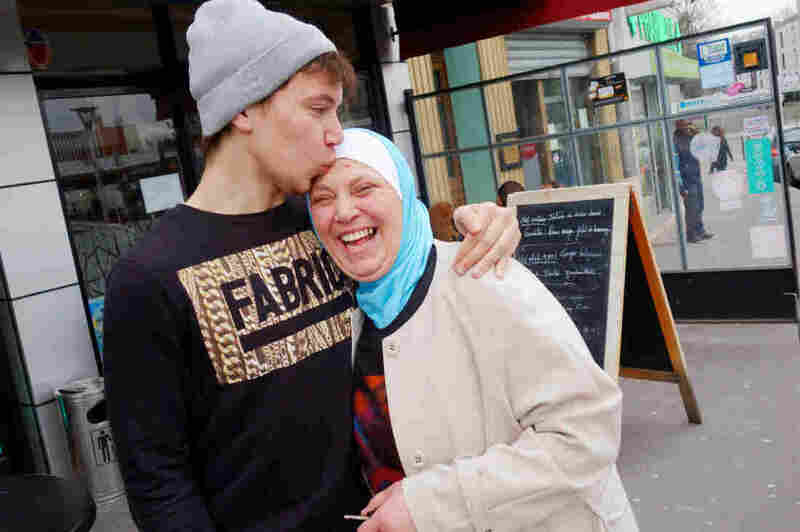 We meet Ismael's mother, Fatihah Medjdoub, at a nearby cafe. As she adjusts the soft, blue-green jersey of her headscarf at the edges of her ears, Fatihah tells me that her family emigrated from Algeria, and that she was born in France in 1963. But she says times are different for her son's generation. "Young people today claim to be more Muslim than they did during my time. We practiced an Islam that was much more ... I can't find the exact word, but we practiced Islam privately, at home," she says. "Today's generation practices an Islam that they seek to understand, and that can lead to prejudices against them." Ismael agrees with his mother, and takes it one step further. "Especially with the young generation — we are telling them that you are not able to wear the veil, and because they are denied in their identity, the only way they have to answer to the situation is not simply wearing a hijab (headscarf) but a niqab," he says, referring to an even more obscuring head covering that leaves only the eyes visible. Despite these challenges, Ismael is adamant: "The fact is that I'm French. ... I will never deny my nationality, and I am very proud of it." He knows that life would be very different if his family had stayed in Algeria. "I'm just grateful to my country," he says, "and I want to contribute to make it better."